Material choice is one of the most critical steps of making a great knife. We use only the best! The first and most important material used in making our knives is stainless steel. Stainless steel has come a long way since its introduction in knife making in the 20th century. Early stainless steels used in knife making had very poor edge retention and dulled easily. Many large, well known knife making companies are using stainless steel that was developed decades ago. This is why many people still believe that old fashioned “carbon steels” are superior. The truth is that the best stainless steels on the market today hold an edge at least as well as carbon steels. On top of this, stainless steel is of course “stainless.” We use leading-edge American steel manufactured by Crucible Industries for all of our blades. All of the knives we make currently use CPM® S35VN™ stainless steel, introduced by Crucible in 2009. The alloy composition and methods used to produce it make it one of the best cutlery steels available. Compared to 440C stainless steel —one of the first of the good knife-making stainless steels, and still widely used today— S35VN offers significant gains in wear resistance as well as toughness (up to 45% better edge retention in CATRA testing). In practical use, we’ve found S35 holds an edge about 2-3 times longer than a typical german chef’s knife, under the same circumstances. 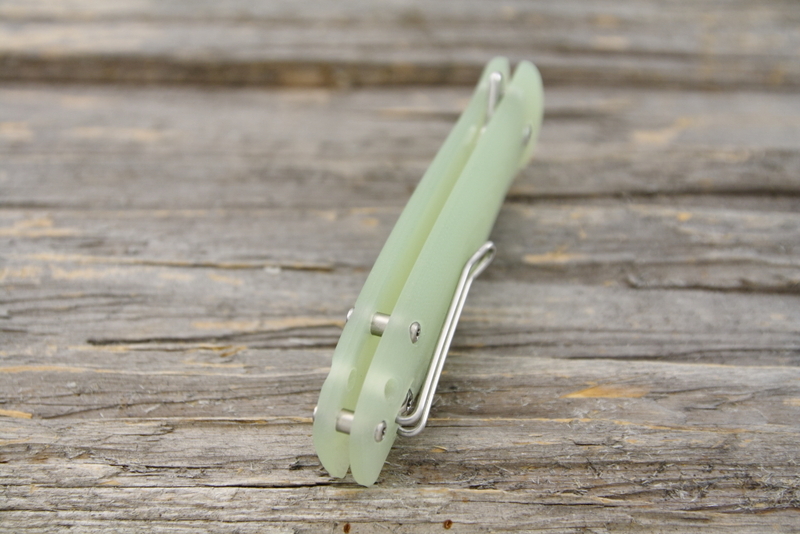 Our standard handle material is called G10, a laminate made up of layers of fiberglass and epoxy resin. It is widely used in the manufacture of custom and high quality production knives for a few reasons. It is extremely strong, virtually immune to cracking, highly stain resistant, available in many colours and very attractive. For an idea of the strength of G10, see our torture test video. This is our newest offering in handle materials and is available for most of our models. This twill weave CF is about 25% lighter than G10 and has an attractive look especially when it catches sunlight. In terms of ruggedness it is very similar to G10. We occasionally produce wood scales for some of our models. 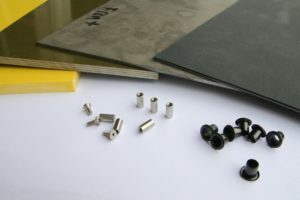 We will entertain special orders but there is lead time of a few weeks. Our main wood is spalted western maple from a tree we harvested in 2010 on Vancouver Island. 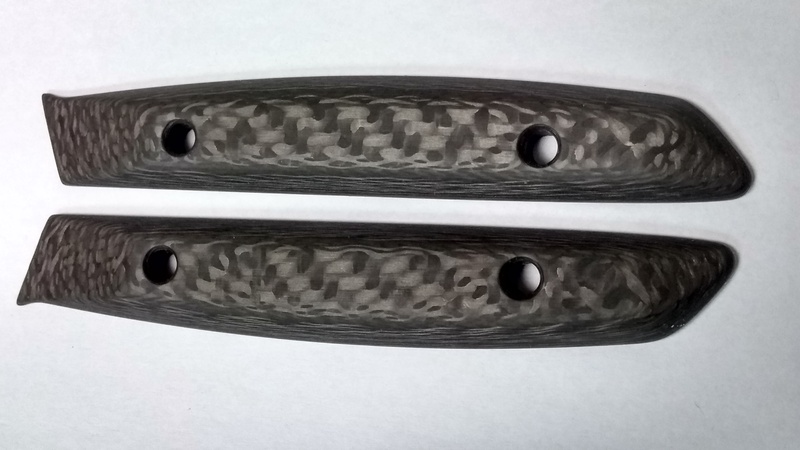 Let us know if you are interested in wood handles and we’ll see what we can arrange. How we treat the wood: Once the handles are milled, We vacuum seal the wood with a highly water resistant epoxy then finish with a durable UV protective layer. 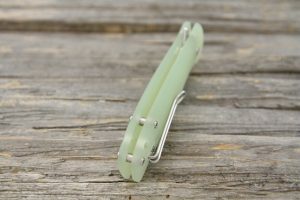 This makes for a handle that works well for a kitchen knife that gets wet frequently. We pack wood handle care instructions with each wood handled knife we ship. Wood does not have the shear ruggedness of G10, but every scale has a unique look. When ordering a knife with a wood handle, let us know if you prefer a particular look and we will try to accommodate you. 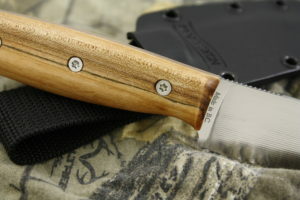 Fixed blade, full tang knives are most often made with riveted-on handles. On such knives, the handles are sanded smooth with the tang at the factory. This results in an apparently flawless flush fit between the tang and handle scales. For both small scale custom makers and for robot-finished commercial knives, this basically means leaving the parts a little oversize during assembly and then sanding it all down to the finished size. We have chosen a different approach, which offers a few advantages. Our process involves making parts to a very close tolerance so that the handle scales bolt on to the knife tang without the final sanding step. The biggest benefit of doing it this way is that it enables the knives to be easily serviceable. If a handle scale is physically damaged, all that is required is to unscrew the scales and put on replacements. With our method the fit is a little less pristine than the all-parts-sanded-at once approach, but we feel that serviceability far outweighs this minor difference. One of our FAQs also discusses handle attachments. The sheaths for our outdoor knives are made of KYDEX® (produced by KYDEX LLC in the USA), a modern thermoplastic. It is a very popular sheath material offering many advantages over traditional leather. It is formed around the knife using heat, this gives the sheath a glove-like fit, keeping the knife secure even when turned upside down. It is also waterproof and stain/chemical resistant. We use brass rivets in sheath construction to provide long term durability and prevent any chance of rusting.